I was interviewed for The Mennonite! Thanks, Shirley, for pointing out to me that I hadn't yet posted the article from a recent issue of The Mennonite! (about time, right?) 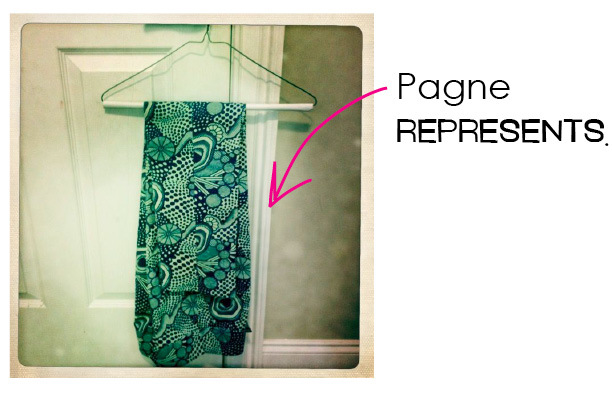 I'm going to rock the pagne pants at Katie's wedding today. I know photographers are supposed to be somewhat subdued in their attire, but, my mother-in-law (watch her on WHSV Monday morning, by the way) made me some seriously hot, super-tailored, stovepipe pants out of some of the most fabulous pagne print ever. See Congo Mama for the real stuff. Some of my favorite treasures of fabric are pieces I "inherited" when the sewing mothers and grandmothers of my non-sewing friends have died. One friend gave me a piece of linen that had been her grandmother's. 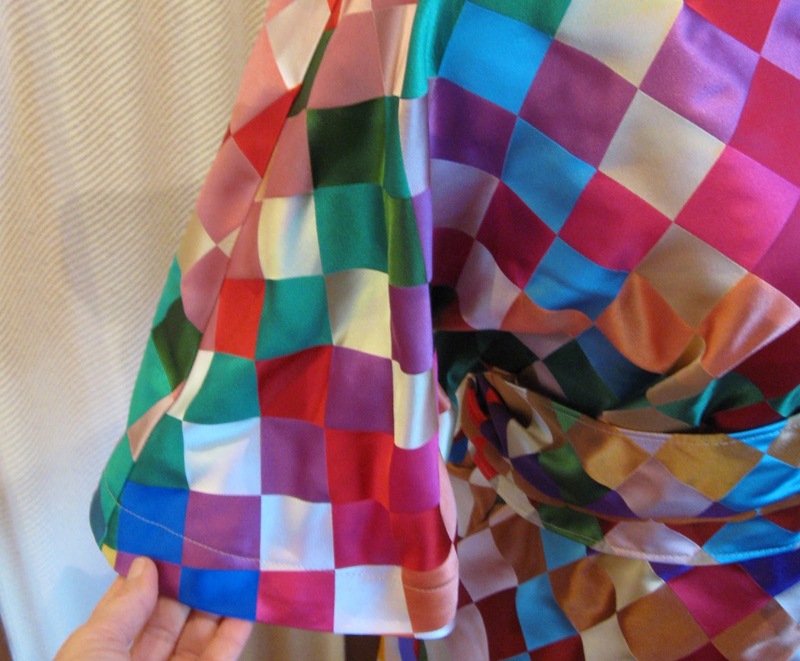 No telling how many decades ago this linen fabric was created. I hope that I have done at least some justice to the great fabric that my friend's mother passed along. 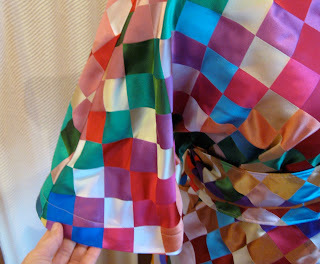 I treasured the fabric here in my studio for many years before I decided to wash it. I washed and washed it, buffeting it to lovely softness. Then I made one of my famous "O-Back Jumper" delights out of it! Do you mind the rumpledy-ness of linen? Hand-stitched red embellishment.... A simple, nice contrast. 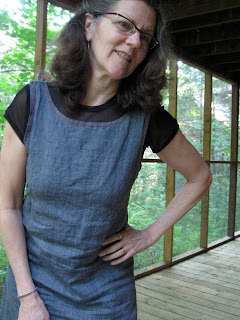 I created a new listing in KathleenTemple, Tailor on Etsy this morning that features my Linen O-Back Jumper as a sample. You can see more information about it there. I was on THE SPARK! 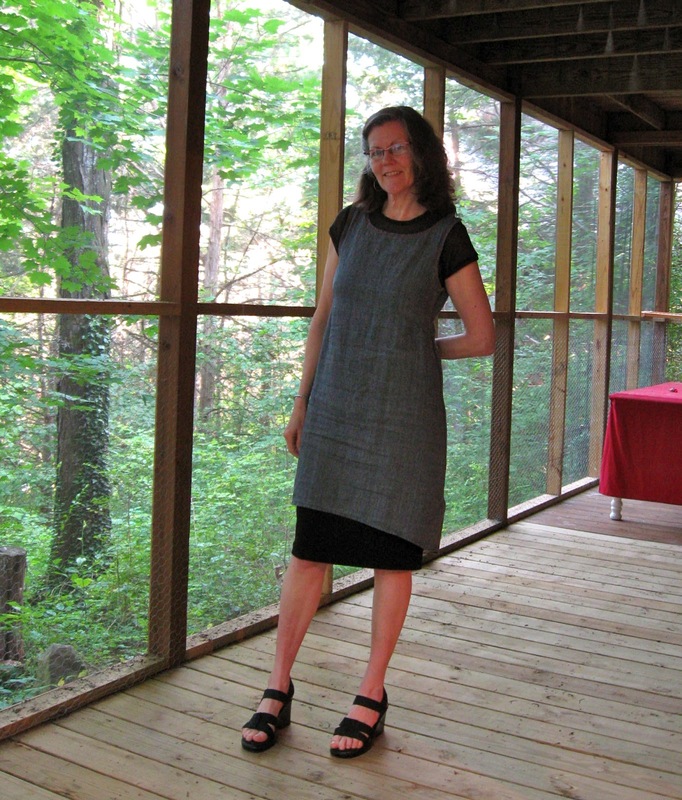 I had the honor of being interviewed by the brilliant Martha Woodroof of National Public Radio fame; I got to talk about my life as a tailor/dress maker/designer. After listening to Martha's show THE SPARK today on our local NPR radio station, I feel proud. And I also love my work even more than I did before! Temple The Tailor on THE SPARK. Take a listen! Martha is a terrific question-asker. And her editing makes me sound pretty good, too. 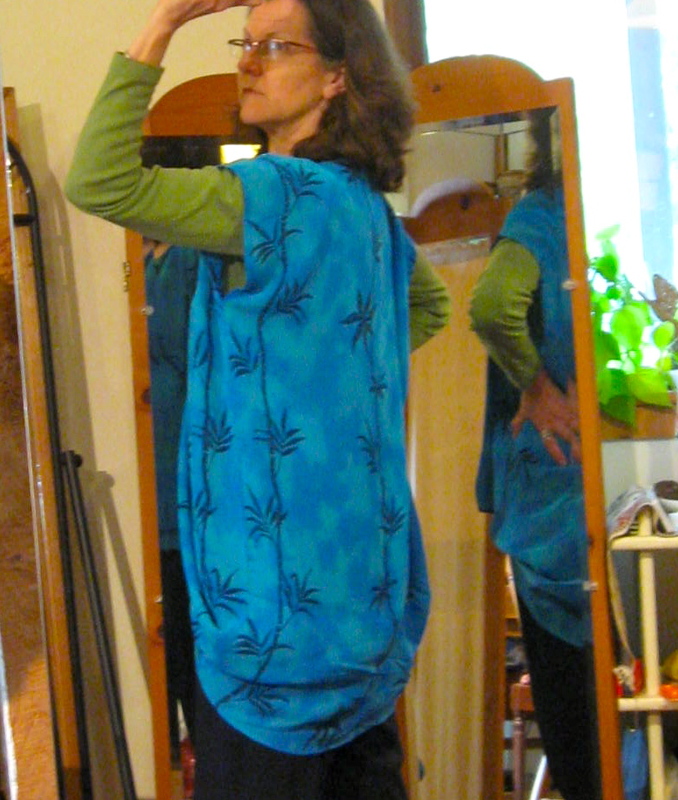 My version will have shirred insets at waist, shoulders, and cuffs, though. 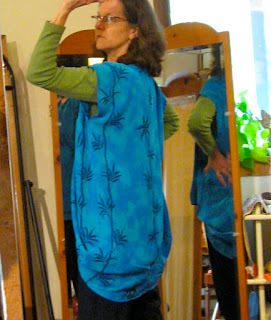 Let's see.... Maybe I will use white crinkle rayon. Or white cotton. Or...... ? 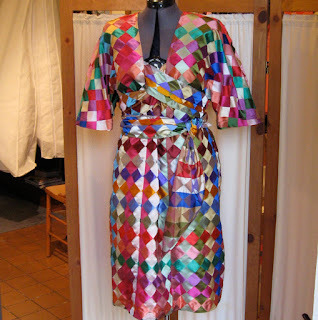 The labor for this sort of dress would be about $200. Let me know if I can plan to make one for you! You will choose the fabric(s) and you will specify all the details. FUN. 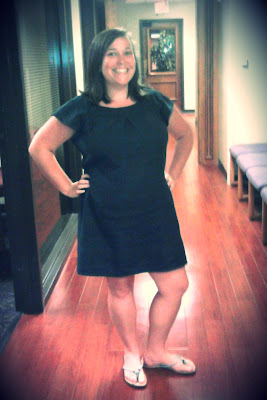 Lacey's One Dress Protest is up to Day 275! Lacey has now worn her dress every day for the past 275 days! 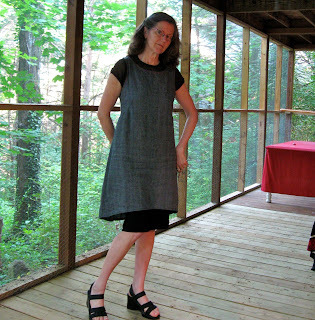 The great hemp blend twill dress I made for my client in Texas last summer is Lacey's One Dress. Read all about Lacey's One Dress Protest, and see how the dress is holding up with only 90 days remaining. 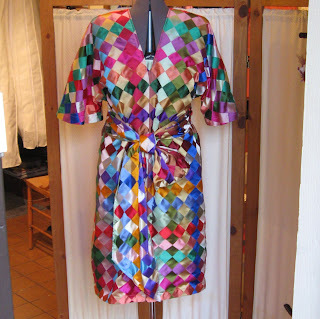 One Dress; she wears it every day for one year. Thanks, Lacey, for the update and for sharing your insights and reflections! A design that failed. .NOT. Well, I at one time I feared that this design had failed. 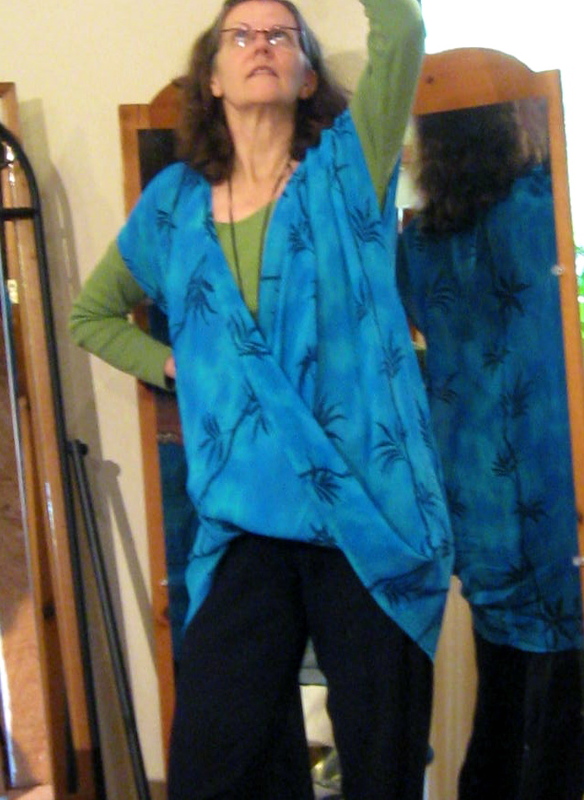 The delightful customer for whom I made the first one in this style ended up not wanting it to be a jumpsuit; she had it made into a top and pants set! She had had to have some changes made to the fit (this happens from time to time when I work with clients who are at a distance!) and elected to have it remodeled as well. But no failure! The jumpsuit I had made for myself in order to work out the design worked perfectly for me. I have worn it about a thousand times over the past year and I love it more all the time. 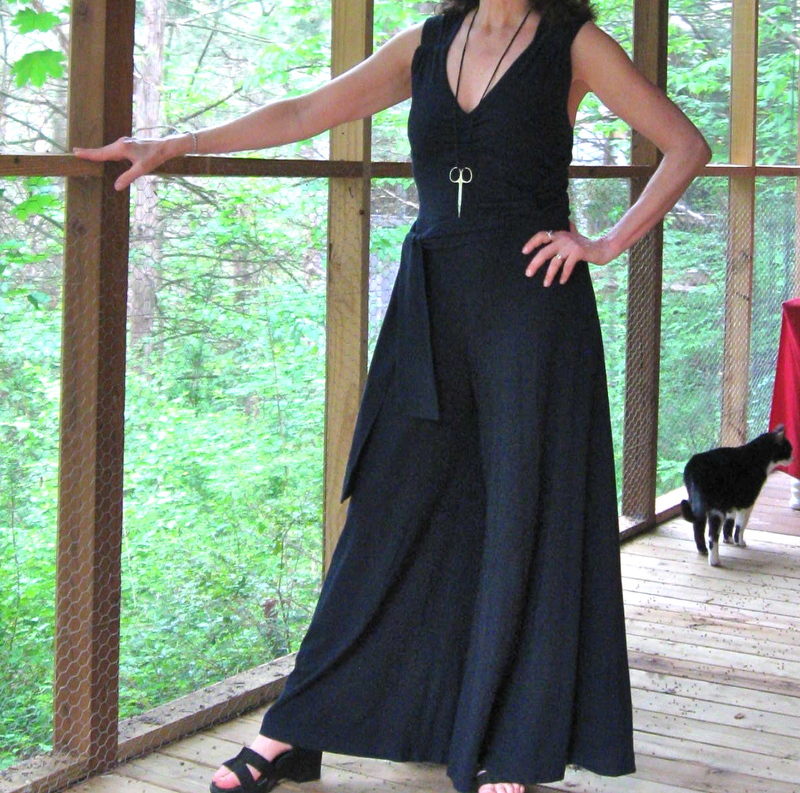 I listed this jumpsuit in KathleenTempleTailor (on Etsy). 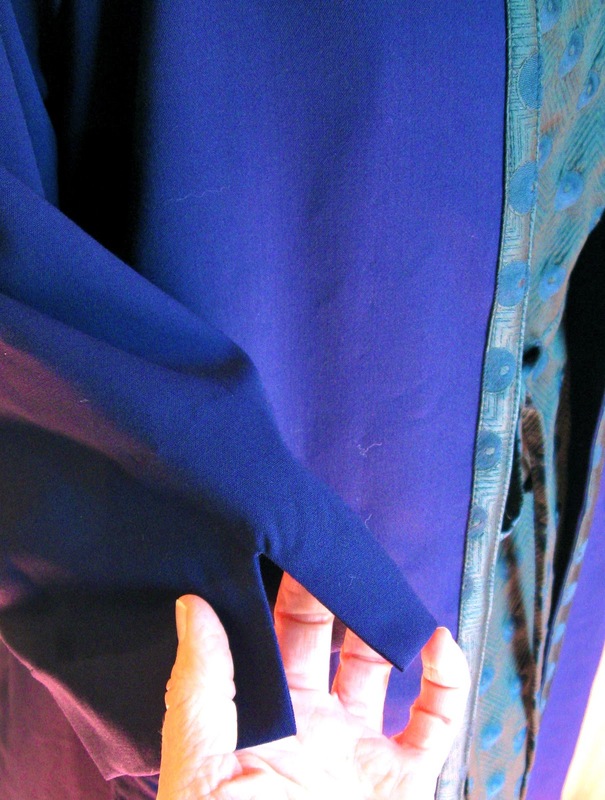 Click HERE to see the specifics about the jumpsuit as a custom creation. I am eager to make more of these great jumpsuits! "Oh, I do love colors!! In architecture, back in school and even till now working, everyone wears black, gray, cream, taupe, etc... (Don't get me wrong, they are nice colors, well, professional.) I'm tired of it, somewhat. I NEED colors for a change. " 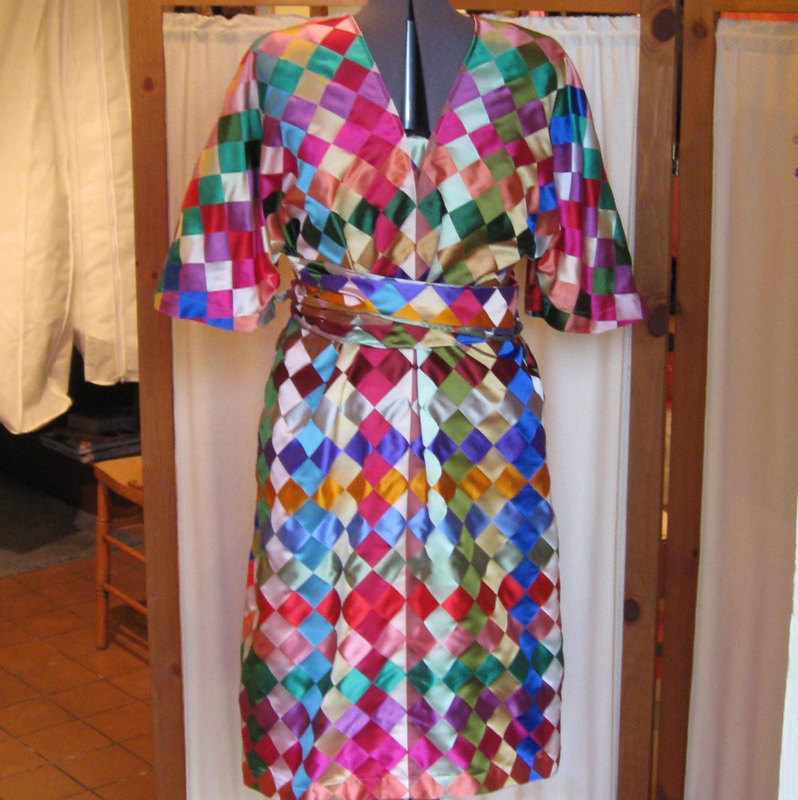 And she sent this SILK COLORFEST to my studio. I created this colorfest dress, based on one of my original designs. It's listed here. Front detail, to show the cross-over sashes. 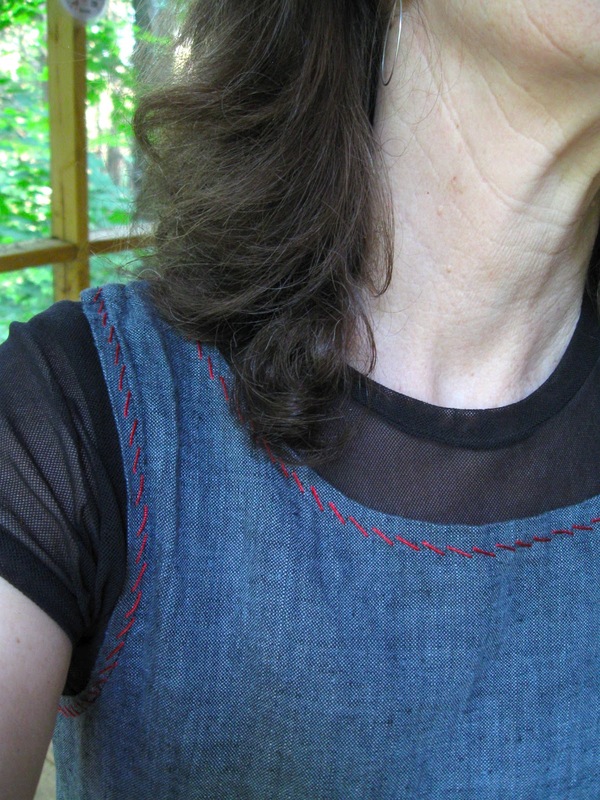 I created little crocheted thread lingerie keepers inside the shoulders. 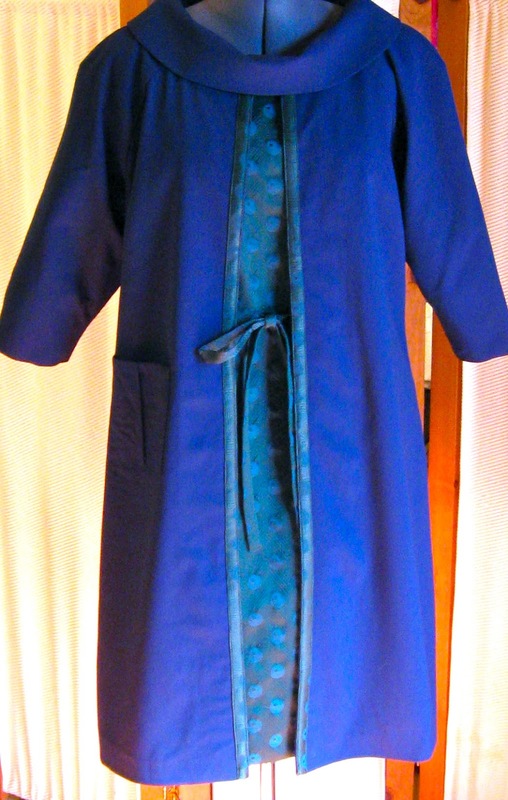 Another front view shows what the dress looks like with the sash ends wrapped twice around to finish in front. 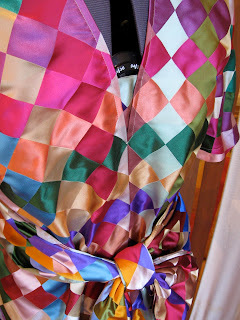 ... the back looks neat as a pin when the sashes are twice-wrapped. 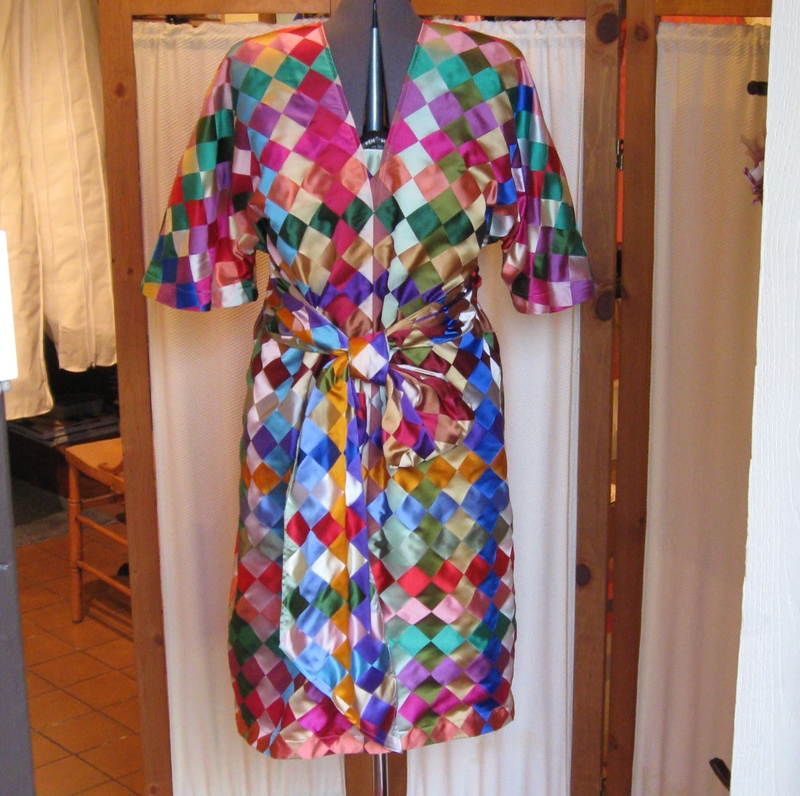 "I LOVE LOVE LOVE the dress! The design is so beautiful and functional! 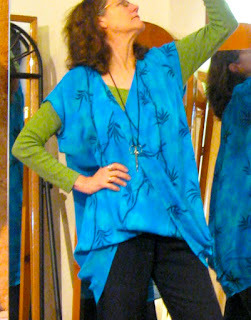 And the color and style is so funky and original - I SO have my favourite outfit sorted! Absolutely a masterpiece. 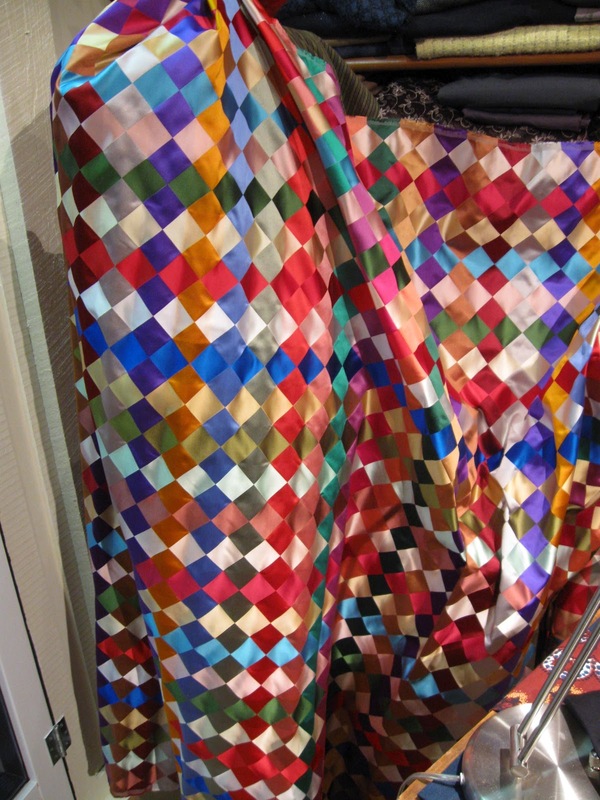 Fits and drapes exactly like what I expected. BEAUTIFUL construction. Kathleen was attentive and kept me posted all the way. Thanks SO much Kathleen for the customer service has been exceptional. Kathleen is a dream to work with, a top notch Etsy seller, I highly recommend! Cheers!!" "The film may have been commissioned by Hermès themselves but from start to finish, the most remarkable thing is that the word Hermès is never uttered. There's hardly a logo in sight unless you count a beautiful horse seen in the stables at the beginning of the film and cantering about in the closing moments, as a reminder of the French house's insignia and its equestrian beginnings in the 19th century. Instead, Laffont and Dupuy-Chavanat cleverly focus on the people working at Hermès' various ateliers, occupying roles such as leather polisher, silk dye colourist, leather craftsmen, glass makers, mould makers - running the gamut across all of Hermes products, not just the famous handbags. This isn't a sensationalist film nor does it rattle on about Hermes' achievements as a company. This is really a quiet celebration of craftsmanship and of men and women who have found their vocational calling and have a desire to fulfil it. Mixing up pigments for silk or massaging leather skins may seem very singular and specific but it's an important cog in the process of bringing Hermes products to life. As someone points out in the film "We're part of a line. It's a snowball effect." "
Vlisco may not market patterns, but MARFY does. 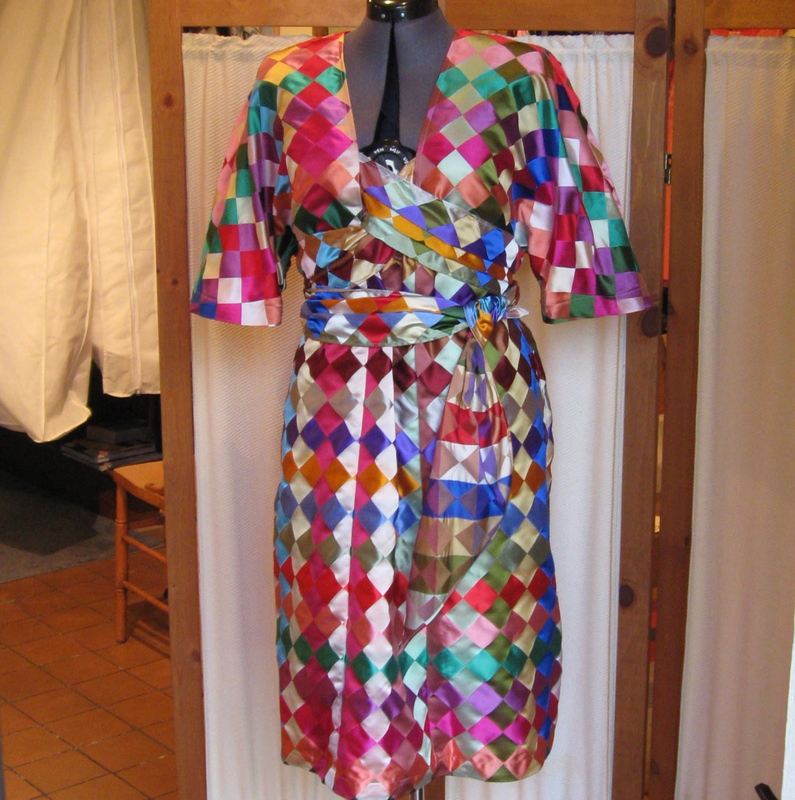 Another beautiful design, the pattern for which is available. I could make either of these dresses for you on a custom basis; the cost would be $300- $450, depending on the fabric you might choose. Another important variable in the cost is your size and figure type. Please contact me to talk about specifics. 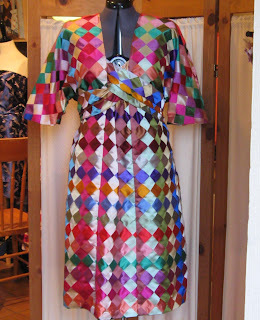 I would love to make some dresses from Marfy patterns! 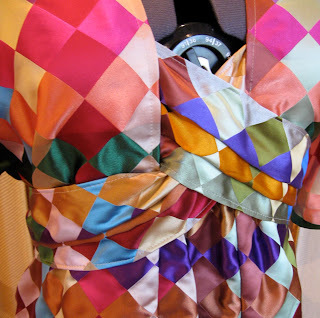 Oh, how I wish Vlisco would sell dress patterns. They sell the awesome fabrics, but no patterns. I am going to make some of these dresses anyway, though. Oh my, my! I am blushing. 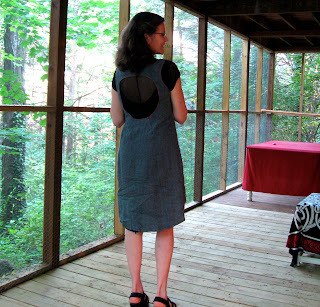 Really, I am honored and pleased to be featured on The Pinwheel Collective! 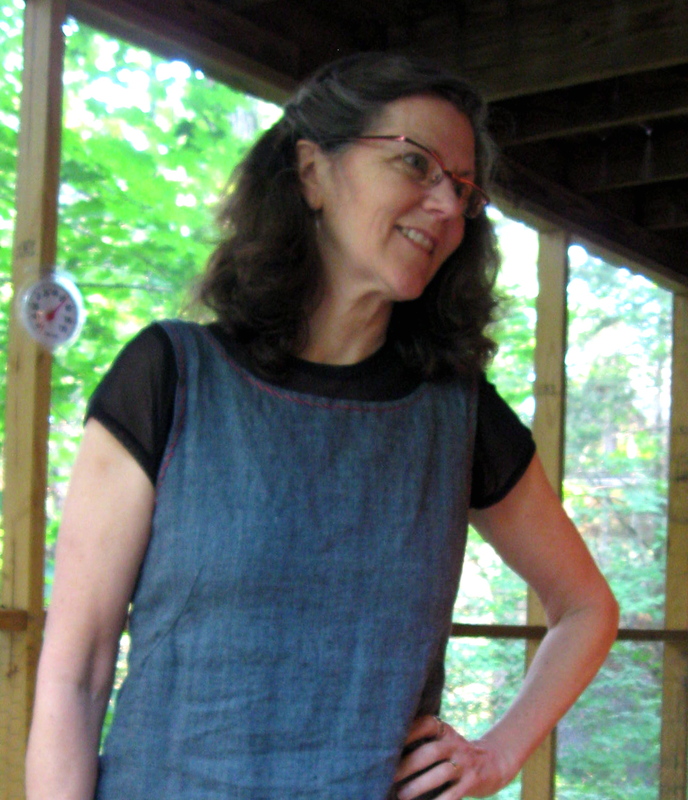 Kathleen has become a friend and creative guru throughout the past year. With a cozy studio full of color, texture, art, and touches of her beloved family, Amelia & I were able to spend time in her workplace, hearing about her fully passionate life. I, Katie, was lucky enough to have Kathleen revamp my mother’s wedding dress to wear to my own wedding this past fall. 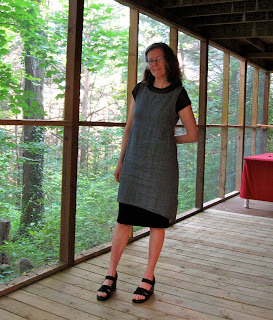 Kathleen brought much more than a skilled hand to this endeavor—she excitedly came up with ideas for this dress, crafting it until it was a perfect representation of what I had in mind. It's bias-draped in the front! 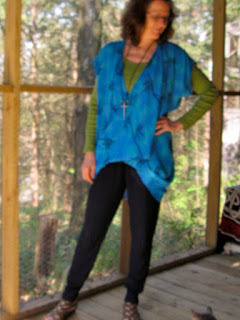 It's too comfortable not to wear every day! 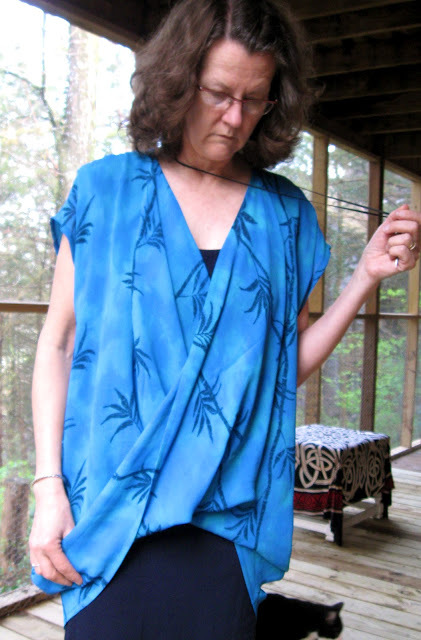 I recently designed this Fold-Front piece because I have been in love with the fabric for years and wanted something super simple and drapey to show it off. Tunics work so well with skinny pants or with skinny skirts. I love contoured hemlines; this design furnishes the contour automatically! 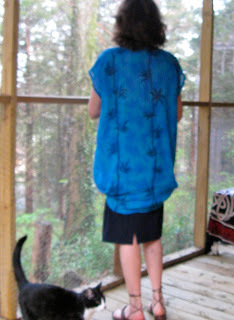 Both porch-lovin' cats were helping me out. Silver first, the Zorro stole the show. YES, I surely can make one for you, in your choice of fabric(s). Click HERE for more info. If I were to make yours just like this one (but in your choice of color/fabric) the price would be about $65. Let me know if you want one! Kathleen did an excellent job fitting my wedding gown, which I had purchased elsewhere. Kathleen also used photos I provided to design a unique side-bustle that complemented the style of my gown. 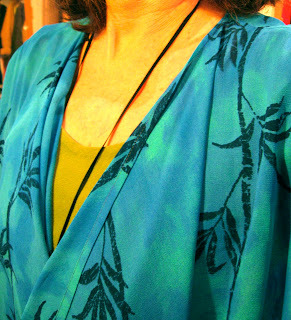 Kathleen is a joy to work with; she seems genuinely happy to work with you on the dress of your dreams. 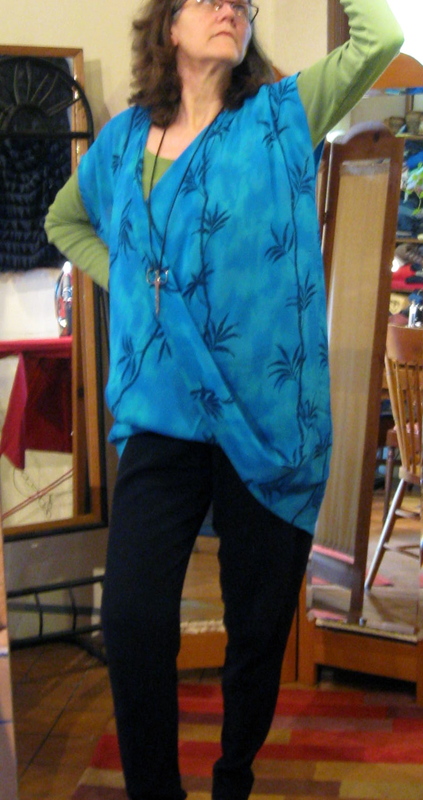 She is positive and upbeat, and can get you in quickly for a consultation or fitting. If I called, often she could fit me in that day, or within the next three days. I have also had Kathleen make adjustments to two other dresses, and was similarly impressed with the speed and quality of her work. One of my friends had Kathleen design and make her wedding gown from scratch. It turned out absolutely gorgeous. I would recommend Kathleen for either dress-making or tailoring a gown bought elsewhere. A VaVaVoom Suit. I'd say so! I am so lucky! 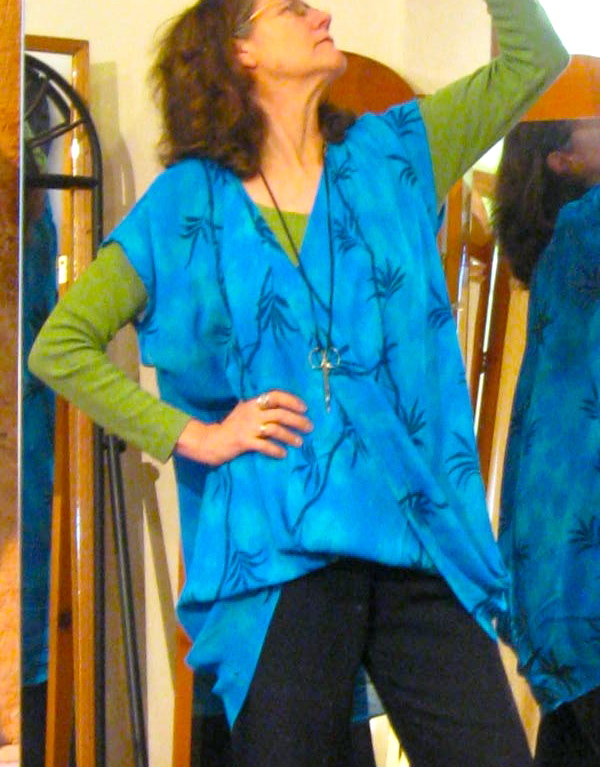 I get to sew for fabulous people who love fabulous fabrics! This rich blue and green peacock jacquard fabric is incredibly lively, yet sophisticated and chic in its drawstring-waist sheath incarnation. The sleeves come to just above the elbow, the dramatic fold-over collar in navy blue wool brings out the dark blue of the peacock colors. 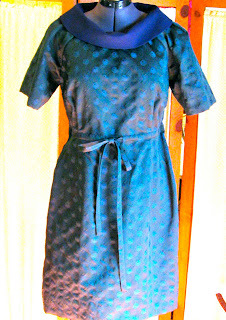 Knee length, this VaVaVoom dress is going to wow the crowd when my beautiful customer gets up to deliver her talk at a conference later in the spring! 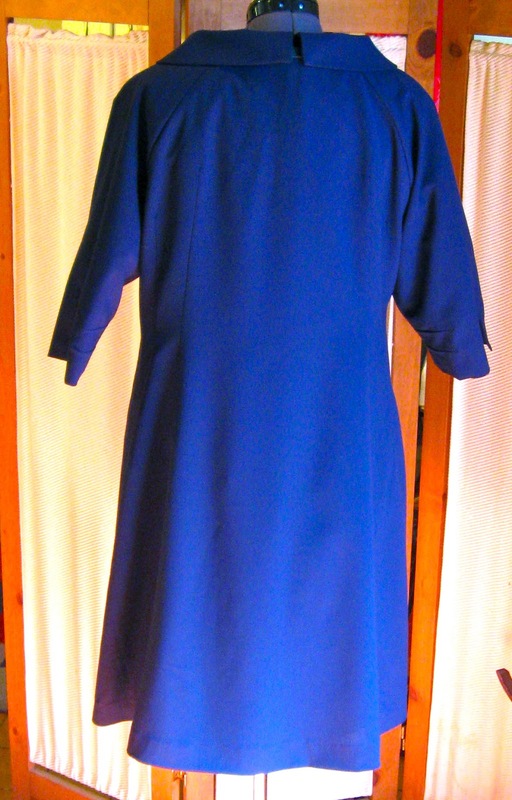 The back of the dress, with its inverted box pleat at the hem. 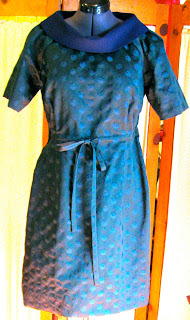 When she walks, the woman of this dress will show a bit of navy blue wool at the back of the hem. 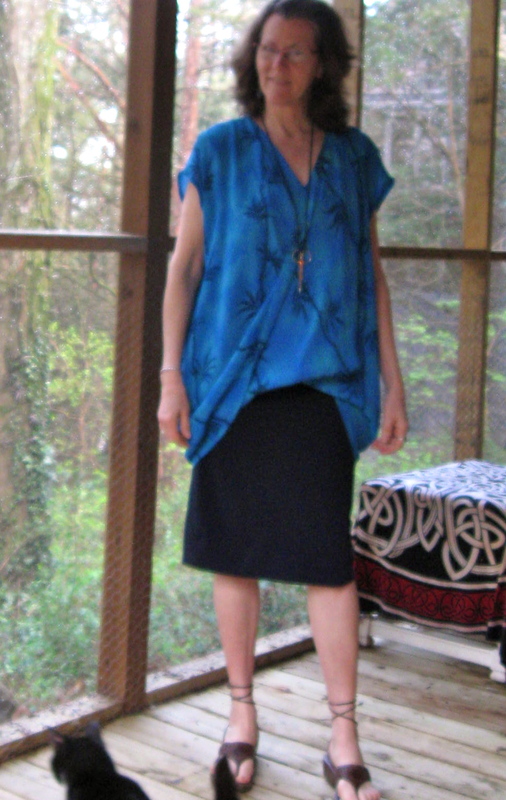 The lower part of this dress, by the way, is narrower at the hem, creating this great "wiggle" dress in peacock plumage! 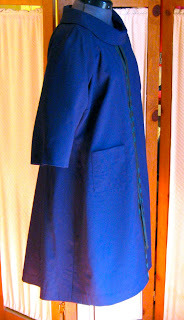 Over the peacock wiggle dress, she can wear the coordinating navy blue wool duster-length jacket. 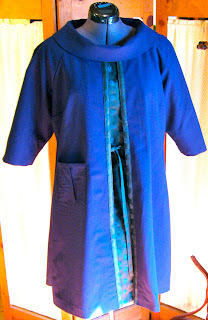 It has 3/4 length sleeves and shares the raglan-sleeve styling of its dress. It is A-line in shape, but is contoured at the waistline. 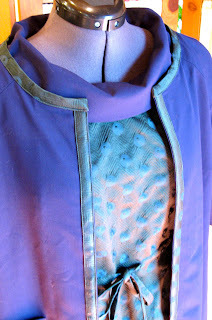 The jacket is trimmed at the neck and front edges with the peacock fabric of its dress! 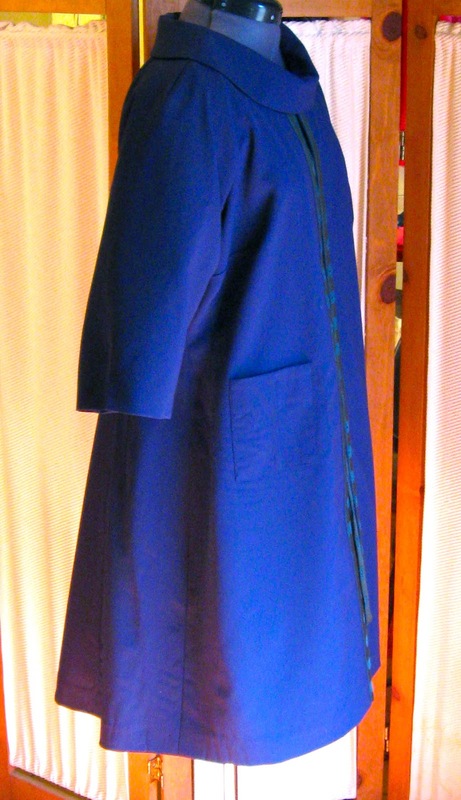 The jacket can be worn with its peacock neckline over the dress collar, if desired. VaVaVoom Suits! Bring 'em on! 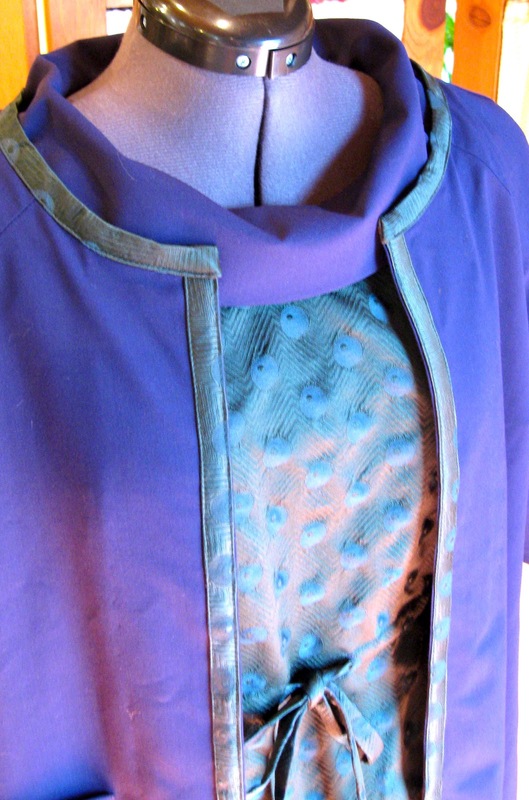 I am posting this feature about the Peacock Colors VaVaVoom suit primarily for my customer to be able to see the ensemble before I ship it off to her tomorrow. I am so glad, also, for everyone else in the world to get to see this great suit she and I collaborated to create. 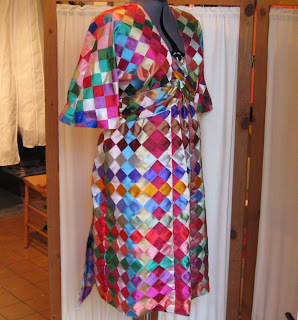 Please let me know what sort of awesome suit I can start making for you, too!